The museum’s recurring programs include the Washington History Club, Readings from the Archives, the Washington Cemetery Tour, New Years Tea, and History Bites. In the morning: Meets the third Monday of the months of March, June, September, and December at 10:00 a.m. at the Washington Senior Center to discuss the history of Washington, Washington Depot, Marbledale, New Preston and Woodville. Share your stories with the group or just listen to the fascinating conversation about our town’s past. Bring your photos and objects for show and tell! At Night: The Washington History Club at Night is a program of the Gunn Historical Museum and Meets the third Tuesday of the months of November, February, and May at 6:30 pm in the Wykeham Room of the Gunn Library to discuss the history of Washington, Washington Depot, Marbledale, New Preston and Woodville. Share your stories with the group or just come and listen to the fascinating conversation about our town’s past. Bring your memories, photos and objects for show and tell! Meets the first Monday of the months of January, April, and October at 10:00 a.m. at the Washington Senior Center. Staff present a paper about the history of Washington from the museum’s archive, related photos and artifacts from the museum are displayed and a discussion follows. 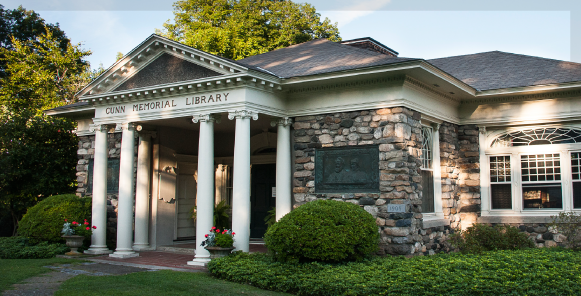 Each spring ten heritage sites throughout Northwestern Connecticut present History Bites, a series of weekly lunchtime programs designed to bring topics of local history to the attention of the regional community. The lunchtime series is hosted on Thursdays between April and June from 12:00 to 1:00 pm. Attendees are encouraged to bring lunch. Beverage and dessert will be provided by the hosting organization. Lectures are free and open to the public. History Bites is sponsored in part by the Connecticut Community Foundation. Michael Kassis, a 2018-19 Gunn Scholar at The Gunnery, will give a presentation as part of the History Bites lecture series. The title of his presentation is Unsung Heroes of The Gunnery. Among many notable alumni The Gunnery has produced, there are many who have served in the armed forces. Focusing on Gunnery veterans from the second half of the 20th century, Michael Kassis will share their stories of military service and sacrifice from the Korean War through the post-Vietnam War era. Attendees are encouraged to bring lunch. Beverage and dessert will be provided by Gunn Historical Museum. History Bites is sponsored in part by the Connecticut Community Foundation. Parking is limited, please carpool. For more information on the History Bites 2019 lecture series please click on this link to view the brochure. Take a candlelit tour through the Washington Green Cemetery and meet some of Washington’s unforgettable residents from the past! A community favorite – hundreds attend each year. Groups of visitors will be led by tour guides dressed in vintage attire along a path of 1,000 luminaries through the Washington Cemetery. Citizens from centuries long ago will be brought to life by costumed actors who will tell their true stories; some amusing, some sad and some tragic. This year’s tour will feature all new stories! Attendees will get numbered tickets for the tours at the Gunn Museum, on a first-come first-serve basis, starting at 6:15 pm on Friday, October 25, 2019 and continuing through the evening until the tickets run out. Tickets can’t be reserved in advance. Tours of the cemetery depart from the Museum with eighteen people every eight minutes between 6:30-8:30pm and last approximately one hour. Refreshments, face painting for kids, and a Halloween themed movie will be shown in the Wykeham Room of the Gunn Library where attendees can wait inside for their tour group to depart. Visitors are encouraged to bring a flashlight, dress warmly, wear comfortable walking shoes, and carpool since parking is limited. The cemetery is dark and the ground is not level so the tour is not recommended for people who are unstable on their feet. Admission is free, donations are welcome. Ring in the New Year with an old-fashioned tea hosted by the Gunn Historical Museum and Gunn Memorial Library. Visitors will have the opportunity to socialize with friends under the historic 1914 gilded ceiling mural by H. Siddons Mowbray and enjoy period music in the festively decorated room. We’ll also have our Washington photo albums out for guests to browse. Guests are asked to bring their favorite tea cup we’ll provide tea sandwiches.